Spain is one of the most desirable sailing destinations in the world. It is extremely difficult to beat the diversity of Spain, a relatively small country which is surrounded by one ocean, two different seas and a great number of different cultures, climates and landscapes. If you’re looking for hot summers, mild winters and rough ocean sailing conditions - Spain is the place to go. However, if you’d like to spend a mild and chilly summer on an atol, Spain is the best destination for it as well. 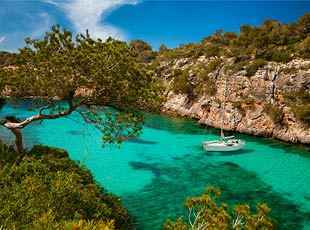 Even if you want a tropical feel on your sailing holiday, Spain can offer it too. The length of the Spanish coastline is close to 6,000 kilometers, shared between the country’s inland territories of the Iberian Peninsula, the Balearic Islands — located on the Mediterranean Coast— and the Canary Islands, situated 100 kilometers west of Morocco (one of the Outermost regions of the European Union). Canary Islands are the place to go if you want to run away from the cold European winter without leaving Europe. Canarian cities like Tenerife and Palma enjoy an almost perfect weather: nights are rarely colder than 15ºC and the daily maximum temperature doesn’t exceed 30ºC. Moreover, the fair winds offer great sailing conditions for sailors. In Spain, trade winds dominate the weather system throughout the year, being the strongest during the warmest hours of the day, from May till late July. Wind speed is usually not faster than 30 mph, but it can be somewhat faster in the wind acceleration zones (WAZ). The Mediterranean Coast offers the opportunity for sailors to discover the Spanish culture at its best, through regions such as Andalusia, Valencia, Catalonia and the Balearic Islands, getting to spend some time in the picturesque and bohemian-like cities and towns of the area: Sitges, Cadaqués, Barcelona, Valencia, Alicante, Peñíscola etc. Last but not least, the unspoilt Northern coast is well known for the best food offer in Southern Europe, and for its intact green coastal landscapes of Galicia, Asturias, Cantabria and the Basque Country, that can only be matched with the landscapes of much colder places like Ireland and Scotland. 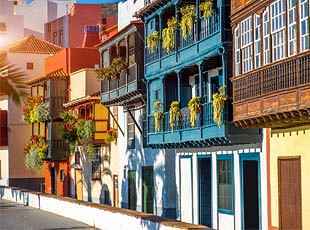 As we’ve pointed out before, Spain boasts close to 6,000 km of coast and is surrounded by two seas — the Mediterranean Sea and the Cantabrian Sea — and the Atlantic Ocean. This heterogeneity is what makes this country so great. The Atlantic Ocean washes a 1,498 kilometer-long coast of Galicia, which is full of estuaries, capes and islands. After crossing Portugal, the Atlantic Ocean meets again with southern Spain in western Andalucía and the Canary Islands - an archipelago formed by seven islands and many more islets. The Cantabrian Sea goes from Galicia all the way to Bayonne, a French city located 40 kilometers from Spain, and it has 800 kilometers of shore. Although less intricate than the Atlantic coast of Galicia, this part of the Spanish seashore can also offer some of the best coastal landscapes one can find in Europe. Meanwhile, the Mediterranean coast of Spain is the most recognizable part of the Spanish coast, with its mild winters and scorching summers, tepid water all year long and a movie-like array of tiny caves and bays, dry landscapes and vibrant cities like Barcelona, Málaga, Valencia and Palma. We’ve explained it before: the best part about sailing to Spain is the fact this sailing destination is suitable for everybody and offers so much options. In addition, you can sail here throughout the whole year. If you want to visit Spain in the winter, between November and February, the Canary Islands are the perfect choice. The climate is mainly sunny and warm, with temperatures very rarely going below 18ºC all year round. Besides that, the sea temperature is constantly close to 22ºC. Both spring and autumn are great for sailing the Mediterranean, because the weather is still great, but you also have the advantage of escaping the big crowds that come to the area as soon as the summer starts. As long as you don’t come in July, August, and maybe even September, the Mediterranean coast of Spain can offer you the best conditions for an amazing vacation full of life, fiesta and culture. However, summer is the right time to pay a visit to the northern coast of Spain, enjoy local food, coastal sceneries and hidden gems such as A Coruña, Gijón, Oviedo, Santander and Donostia. Be careful, though. The Atlantic Ocean can get a bit rough at any time of the year and you might need to look for a haven in July or August as well. Anyway, don’t worry, you can easily find a shelter for your boat here. Another thing to be aware of is the water temperature, especially in Galicia, where it doesn’t usually go beyond 15ºC, not even during summer. The Canary Islands are definitely the top experience in Europe if you want to spend your sailing holidays on a tropical destination without travelling far away. Those 7 islands offer a bit of everything for everyone and are a true paradise. Tenerife is the biggest island in the Canary Archipelago and, except for beaches and nightlife, it is where the highest peak in Spain is located. Mount Teide, with its 3,718 meters, was named World Heritage Site back in 2007. Going north from the capital of the island, you will come across the Antequera Bay, a sandy and dry beach surrounded by cliffs, which is a perfect spot for anchoring thanks to being sheltered/protected from all winds, except for the southerly ones. Gran Canaria offers the same mix of beaches, mountains and nightlife that Tenerife does. Las Palmas, the biggest town on the island, is also the most important town in the Archipelago. Fuerteventura and Lanzarote are the natural gems of the Canary Islands. The first one was declared biosphere reserve by UNESCO in 2009 and is a prime destination for water sports, thanks to strong winds, powerful waves and a diverse underwater life. Lanzarote, on the other hand, is a stunning volcanic island with black beaches and a beautiful park - Timanfaya Park, entirely made up of volcanic soil. Close to this area of black sand beaches, one can find the Papagayo Beaches, a group of beautiful caves with white sand and crystal waters, very well sheltered from the usual Canarian trade winds. There is something about the Mediterranean lifestyle, about its food, its relaxed way of life that is simply so attractive to anyone who comes from abroad. The Balearic Islands are the real example of that. The islands of Menorca and Formentera boast some of the most stunning beaches and caves in the world, all surrounded by a hippy vibe you just can’t miss. Mallorca and, especially Ibiza, as you might know, are some of the best destinations in Europe when it comes to nightlife. Every spot and every corner of the Balearic Islands is perfect for holiday sailing and enjoying life to the fullest. If you are looking for anchorages for your boat, the island offers two special ones: Sa Foradada, a must-see for sailors who want to enjoy an astonishing landscape sheltered from most winds, with an easy access for boats; and Cala Brafi, a virgin corner surrounded by lush vegetation, where only boats with a shallow draft can anchor. Do you want some action? Sail just for a few hours from the Archipelago and you’ll be in Barcelona, Alicante or Valencia. If you want to find a quiet and appealing spot to escape to from one of these cities, we recommend Tabarca, a tiny islet historically inhabited by fishermen and located only 15 kilometers from Alicante and 8 kilometers from Santa Pola. Although it is forbidden to anchor around the island, there are two marinas where you will be able to do it. 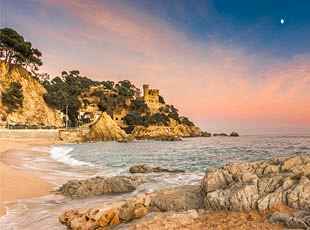 We also suggest visiting the Garraf Beach, which is situated about 30 kilometers from Barcelona and which is one of the quietest spots to anchor in the vicinity of the Catalonian capital. San Sebastián or Donostia (as it is known in Basque) is the food capital of the Iberian Peninsula, and maybe of the whole Europe. No city has a bigger average of Michelin Stars per kilometer in the world, and only a few cities can match the beauty of San Sebastián. Be sure to visit! A Coruña, in the west corner of Spain, is the most ‘oceanic’ city in the country and a place completely open to the Atlantic Ocean. Here you will find the best seafood in Spain. Mediterranean Coast climate with hot, dry summers and mild, dry winters. The average temperature in the winter ranges between 5°C and 15°C, while going up to 26°C and 35°C during the summer. The sea temperature amounts to around 14°C in February and 25°C in August. Northern Coast climate is colder and much rainier, although the summer tends to be mild and sunny. The average temperature in the winter ranges between 5°C and 10°C, and between 15°C and 23°C during the summer. The sea temperature amounts to around 10°C in February and 22°C in August. Canary Islands climate is tropical and desertic, moderated by the sea and in summer by the trade winds, so temperature practically never goes below 15ºC or beyond 30ºC. Some areas also have a subtropical humid climate. Water temperature is moderate all year long. When sailing to Spain, one of the most reliable sources for weather information and forecast is accuweather.com, which offers detailed and geographically specific information about any spot in Spain. Another reliable data source is aemet.com. The Spanish weather is fairly stable but it can also be prone to winds. Tarifa (Cádiz), the most southern point of Spain, has excellent all year-round wind conditions, and it is one of the main destinations for windsurfers from all over the world. Borrasca - a thunderstorm or violent squall, especially in the Mediterranean and the Northern Part of Spain. It usually comes from NW, W.
Chubasco - a rapid and strong downpour, it starts up very quickly but stops in a matter of minutes. It is very common throughout the country. It doesn’t come from a specific direction. Levante - a hot wind from E, NE, that can be especially strong in the area of the Strait of Gibraltar, where the local conditions increase its power and speed. Lebeche - another warm wind from SW, this one coming from the Sahara, bringing elevated temperatures and sand from the desert. In the Canary Islands area, it is also known as calima. Galerna - stormy, hot and very humid NW wind that arises unexpectedly on the North Coast, especially during the summer season. Wind gusts can go up to more than 100 kilometers per hour. Tramontana - originated in the French Central Massif and the Pyrenees, it is a N wind that blows strongly over the Balearic Islands and some parts of Catalonia. Sometimes it can reach speeds close to two hundred kilometers per hour. The coast around the Balearic Islands is shallower than in the rest of the country, since it is not in the open Ocean like the North Coast and Canary Islands. On the Mediterranean Coast, there are practically no tides. The Cantabrian coast of Spain has a tidal range of 1 meter. On the Atlantic Coast (Galicia, Canary Islands) tidal range can go up to 2,8 m.
In the Mediterranean, waves occur primarily because of the wind blowing. Normally, the heights of waves in the Mediterranean range between 0.5 and 1.5 m, and very rarely exceed 5 m.
However, the Atlantic and Cantabric coasts are a whole different thing. There, waves can easily go beyond 10 meters during the winter. Actually, the biggest wave recorded in Spain was appeared near to Galicia, and was 27,81 meters high. Of course, that makes the northern facade of the Spanish coast a place to go for any surfer specialized in big waves. Sea currents occur under the influence of winds, differences in pressure, temperature, and salinity. The currents of the Mediterranean can hardly be noticed, but this changes on the Atlantic side of the Spanish coast. The Galician coast is under the influence of cold currents all year long, but the more east you go, the warmer water you’ll get.